Autotrader editors have revealed their top deals on certified pre-owned (CPO) vehicles for the month of November. As holiday shopping quickly approaches, shoppers have already started looking for smart buys and deep discounts. Automakers are making the search worthwhile by offering special deals on CPO vehicles all month long. Audi’s CPO program boasts an impressive 6 years or 100,000 miles of bumper-to-bumper coverage. This month, Audi is also offering 1.9 percent interest for up to 60 months on all CPO 2013-2015 models to qualified shoppers. Drivers paying cash get an extra bonus: $500 cash back on CPO 2014 A4, 2014 A6 and 2015 A3 models. Chevrolet’s CPO program offers an excellent powertrain warranty that covers vehicles for up to 5 years or 100,000 miles from the original sale date, plus a bumper-to-bumper warranty that adds another year or 12,000 miles to the original coverage. 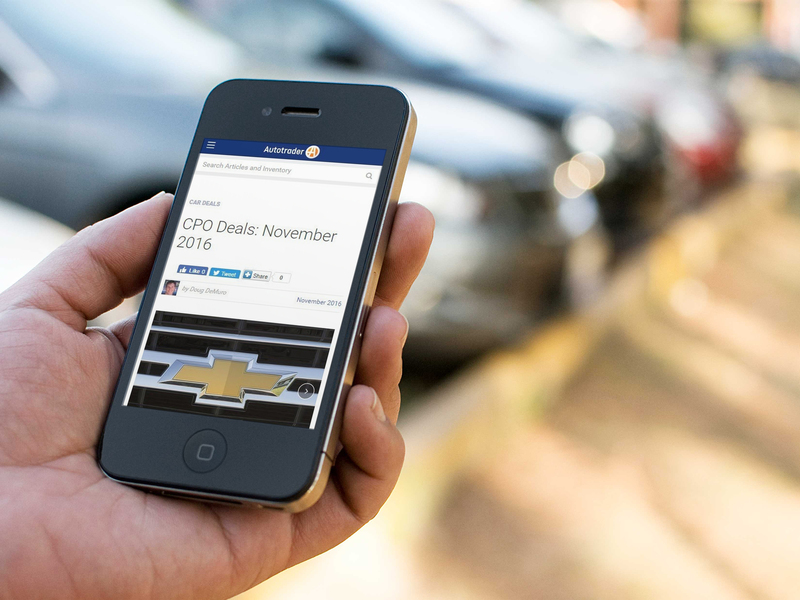 Through the end of November, qualified shoppers can get 1.9 percent interest for up to 3 months on all CPO Chevrolets. Hyundai’s CPO program touts 10 years or 100,000 miles of powertrain protection, and 5 years or 60,000 miles of bumper-to-bumper coverage from the vehicle’s original sale date. In November, a special financing offer makes CPO Elantras and Sonatas even more appealing at 0.9 percent interest for up to 48 months to qualified buyers. Jaguar’s CPO warranty entices luxury vehicle shoppers with 6 years or 100,000 miles of bumper-to bumper, no-deductible, fully transferrable coverage. This month, the brand’s midsize XF luxury sedan has an added draw where qualified shoppers can get 0.9 percent interest financing for up to 60 months on 2013 and 2014 models, and 1.9 percent for up to 60 months on 2015 models. Kia’s CPO program covers powertrains for up to 10 years or 100,000 miles from the original sale date and includes a year or 12,000 miles of bumper-to-bumper protection. Add to that a special financing rate available only in November for qualified shoppers, and it’s a steal at 0.9 percent interest for up to 36 months on all CPO versions of the Optima midsize sedan and Sorento SUV. Mazda’s CPO program offers a year of additional bumper-to-bumper protection, as well as up to 7 years or 100,000 miles of powertrain coverage from the original sale date. An excellent financing incentive offered to qualified buyers in November makes the program even more alluring: 1.49 percent interest for up to 36 months. MINI’s CPO program offers up to 6 years or 100,000 miles of bumper-to-bumper coverage from the original sale date. And in November, qualified shoppers get not one but two additional incentives at 0.9 percent financing for up to 36 months on all leased 2013 and 2014 models, and $500 cash back on all 2013 and 2014 CPO cash purchases. Toyota’s CPO program offers a year of bumper-to-bumper warranty coverage in addition to powertrain coverage protection for up to 7 years or 100,000 miles from the original sale date. All month long, CPO RAV4 models offer the added benefit of 1.9 percent financing for up to 60 months to qualified shoppers. Autotrader is a Cox AutomotiveTM brand. Cox Automotive is a subsidiary of Cox Enterprises. For more information, please visit http://press.autotrader.com. Cox Automotive Inc. is transforming the way the world buys, sells and owns cars with industry-leading digital marketing, software, financial, wholesale and e-commerce solutions for consumers, dealers, manufacturers and the overall automotive ecosystem worldwide. Committed to open choice and dedicated to strong partnerships, the Cox Automotive family includes Autotrader® , Dealer.com® , Dealertrack® , Kelley Blue Book® , Manheim® , NextGear Capital® , vAuto® , Xtime® and a host of other brands. The global company has 33,000 team members in more than 200 locations and is partner to more than 40,000 auto dealers, as well as most major automobile manufacturers, while engaging U.S. consumer car buyers with the most recognized media brands in the industry. Cox Automotive is a subsidiary of Cox Enterprises Inc., an Atlanta-based company with revenues of $18 billion and approximately 60,000 employees. Cox Enterprises’ other major operating subsidiaries include Cox Communications and Cox Media Group. For more information about Cox Automotive, visit www.coxautoinc.com.